The was the conclusion I came to on a Friday night just over a week ago when my bathroom scales told me I weighed 92.2 kg, which according to a BMI calculation for my height and weight puts me into the “overweight” category. Not the best place for someone who has a family history of heart disease and who is already exhibiting early signs of osteoarthritis. Of course, I have known this for a while – prior to the Christchurch quakes I weighed around 85 kg, however, when the quakes stuck and took out my gym (and most of the others around Christchurch) for 6 months my weight increased, helped along with the comfort food consumed during this time. Even though I still go to the gym 3-4 times a week, I’ve never lost the weight I gained. 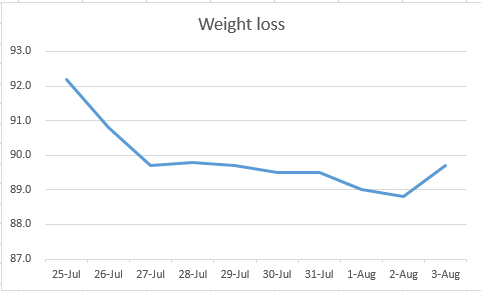 I’ve been meaning to do something about it for a while now, but on Friday a convergence of several factors helped me resolve to explore how to lose some weight. One of these factors was watching a documentary by Michael Mosley called Eat Fast and Live Longer. In the documentary Dr Mosley explored the use of fasting to improve health and encourage weight loss. Various approaches to fasting were explored but by the end of the documentary Dr Mosley had settled on a 5:2 approach to dieting, whereby calorie intake was restricted to 600* calories a day for two days of a week, while one eats normally for the other 5 days. A book has now been produced based on this documentary outlining this dietary approach. So on Saturday, I decided to try to see what this fasting approach would be like. Porridge with half a banana and skim milk for breakfast consumed 150 calories. Finding myself hungry by lunch a sandwich with soup took out 300 of my remaining allowance of calories. By evening I was hungry for more than the remaining 150 calories so had a reasonably healthy chicken and vegetable dinner of 386 calories. So fasting wasn’t as easy as I thought, however, I had achieved a day of relatively low calorific intake. If I could sustain this surely I would lose weight? I decided to turn this into an experiment – if I continued on a restricted calorie diet would I lose weight? The short answer is yes. The orange line is the number of kJ which the MyFitnessPal determined that I should be able to get moderate sustained weight loss with. 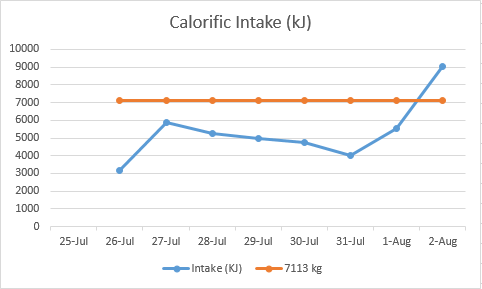 The blue points indicate my calorific intake for each day (in kJ) with large increase on the 2nd of August due to a “cheat day” where I ate what I felt like, including some chocolate brownie ice cream. Some well known diets recommend a cheat day once a week as a treat. As well as relaxing for a day I was interested in seeing what effect it had on my weight. Over the week I have had a significant weight loss. However, most interesting to me is what happened at the beginning when I went from a day (Friday) of poor eating choices to a restricted calorie diet. The drop in weight was quite substantial. Also, the morning after my “cheat day” my weight jumped by almost 1 kg. It is an interesting effect which I’m curious to explore further. I have been on a 5:2 diet for over a year and lost just over 10kg. The biggest problem I found was that the two light days in isolation were not enough. It was actually possible to over eat enough on the other days to cancel it out. Once I worked that out it has been a steadyish slow drop. I think I am starting to bottom out on what this weekly caloric intake will allow, but hope to settle in the mid to low 60kg, which is about the right bmi for my height. This is the only diet I feel comfortable sticking with. And you can eat a surprising amount for 600 kcal. That is really interesting. From what I have read so far some peole have suggested that the fast days make them want to eat less on other days perhaps because the stomach contracts on these days? Being satisfied with 600 calories depends on the type of food. A lot of diets recommend vegetables, fruit and high protein foods to help satiate hunger. Great to hear form someone who has being using it successfully for a year. Good for you Michael. To assess the diets effect you may need to add in your “gym days” as a covariate. Thanks. The iPad app actually “allows” you additional kJ on the days you go to the gym. I’ll have a think about how the exercise might be incorporated as a variable (might need some advice too). Yes, exactly this. The ratio of stored glycogen:water is typically stated as 1:2.7 (although variation exists), so glycogen depletion can manifest as marked weight loss, and conversely, repletion as a signficant and rapid gain in measured weight. Actually now you mention it. After a few months on the 5:2 I did find that there were some changes. The first is that the light days are never “easy”, but I started to look forward to them. I also found that the amount I could eat reduced significantly (although eyes bigger than belly is still a problem). Plus now I often feel full, which rarely happened previously. The desire for sweet things has gone down, and some foods (creamy cakes, McD’s for example) now make me feel quite sick/bloated. I have never really counted calories on the light days either, but is not hard to estimate about 600kcal.